National Volunteer Week, April 7-13, is a time to honor and acknowledge all that volunteers do to keep our communities healthy and strong. At Riverwood Healthcare Center, more than 100 volunteers give their time to a wide range of activities at the hospital and clinic. 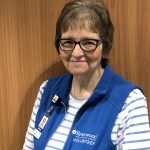 Renee Irwin, a Riverwood Auxiliary member who started volunteering at the Aitkin hospital in January, shares her story of why she wants to give back to an organization that has given her so much. “A few years ago, my husband, Brad, received such wonderful care for a terminal illness at Riverwood. From 2012 to 2016, we were here a lot for clinic appointments and hospitalizations. We were on a first-name basis with so many of the doctors, nurses and technicians. It was like a family, very comforting to come where everyone was so supportive. The care was just awesome! All the doctors and nurses were topnotch! I’ve been on my own a few years now since my husband died in the fall of 2016. Last December, Carla Hakes, a friend at church and an active Auxiliary volunteer, invited me to volunteer at the hospital. I began to see that volunteering would be a great way for me to give back for the wonderful care for my husband and myself. I grew up in Fergus Falls and my husband in Motley, and we moved to Aitkin in 1988 with our young daughter, Molly, who attended the Aitkin schools and now lives in the Twin Cities. My husband and I were both teachers at the Aitkin High School so we had a strong connection with and affection for community members. I taught home economics, and Title 1 for math and reading, for 26 years, and I still do some substitute teaching in Aitkin. Brad taught agricultural education and science. Now, when I’m volunteering greeting patients and visitors in the hospital and clinic main lobby, I enjoy being that friendly face and voice for people who may be feeling down due to ill health. With the Aitkin clinic under construction, we volunteers play an important role in directing patients on how to navigate the newly renovated check-in and other spaces. I like to help save steps for those who may have physical disabilities. I work about three 4-hour volunteer shifts a month, sometimes more when I’m needed to fill in for another volunteer who can’t work a shift after all. For more information on volunteer opportunities at Riverwood, contact the Auxiliary office at (218) 927-8286.